"If you're serious about quitting smoking, My Last Cigarette is for you!" Quit smoking today with new My Last Cigarette and stay quit. My Last Cigarette is a proven aid to help you resist restarting this fatal habit. My Last Cigarette is a serious tool based upon years of medical research into the harmful effects of smoking. Simply enter your personal details and watch how your statistics are updated in real time, every second. Especially effective when used in conjunction with nicotine replacement therapy (eg patches). My Last Cigarette has helped 100s of users successfully resist restaring smoking. 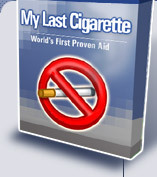 If you are serious about staying quit then My Last Cigarette could make all the difference. I have tried smoking numerous times and never stuck with it. I purchased this program and was really surprised at how having the ability to visualize your progress really helps keep you motivated to quit smoking. I have not had a cigarette in 90 days and actually have no desire at all to light up. I think this program is a great tool to help you quit. It won't do all the hard work for you but it can give you a big helping hand when the craving starts. Just look at the graphs and imagine having to go back to square one. Havn't smoked a cigarette since 19th April 2002 after being a smoker for twenty years. It really helped me personally to graphicaly see what was happening inside my body and all the other information has only helped strengthened my resolve. I haven't picked up a cigarette since I got it. Didnt knew if it was the knowledge of my cc being billed for the app or what but i have no smoked since i bought it it helps a lot to see graphically how your health is. COOL! This will have you quitting in no time. It's morbid, surreal, deadly serious, and those numbers just keep on updating. I'm sure glad I didn't have to write this thing ! Obviously done by smokers.